Bob Dylan has been a prolific painter and draughtsman since the 1960s. The multi-talented artist has, however, long kept this lesser-known aspect of his work to himself; only over the course of the last three years has he appeared in public as a painter, exhibiting watercolours and drawings. The National Gallery of Denmark’s major autumn exhibition sees Bob Dylan presenting large-scale paintings for the first time ever: The Brazil Series, which consists of all-new, never-before-seen works. While Bob Dylan’s paintings and songs can be said to complement each other on certain points, his visual art should nevertheless be regarded as a fully rounded universe in its own right. If you search the paintings for visual assistance for your interpretations of Dylan’s songs and music, you would seek in vain. Rather, the works seem to spring from a deeply felt need on the artist’s part to express himself in solely visual terms. Or, as Dylan himself emphasised in his dialogue with the Gallery while working on his new paintings: ”If I could have expressed the same in a song, I would have written a song instead”. 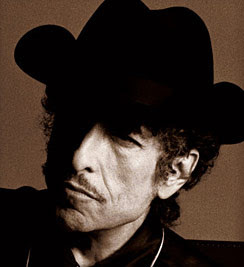 Bob Dylan’s visual art is infused with the same constant urge for renewal and innovation that characterises his music. He seems to find no satisfaction in settling on a specific mode of expression once he has followed it through to its logical conclusion; rather, he is constantly experimenting, trying out new artistic devices, approaches, and modes of expression. When the National Gallery of Denmark approached him in the autumn of 2008 he regarded the watercolours and drawings executed by him so far as a closed chapter. The upcoming exhibition at the Gallery thus became the concrete catalyst behind an artistic change of direction and a period of intense work for Bob Dylan. In a new departure, he began working with acrylics and larger formats, and his visual idiom has also taken a new turn. The final result is The Brazil Series, which comprises around 50 paintings. ”I've been to the National Gallery of Denmark and it definitely is an impressive art museum. It was more than a little surprising when I was asked to create works specifically for this museum. It was an honor to be asked and a thrilling challenge. I chose Brazil as a subject, because I have been there many times and I like the atmosphere,” Bob Dylan states. 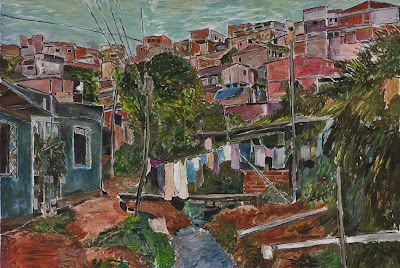 Bob Dylan’s new series reflects the settings and people he came across in Brazil. Here, we find depictions of everyday scenes in cities and in the country. Wine growers, gypsies, politicians, gamblers, and gangsters. A motley collection of motifs and subject matter that accentuates the artist’s fascination with the diversity of Brazil. The works appear almost like anthropological records, shorn of any romantic sentiments, preconceptions, or social commentary. The motif itself, its compositional potential, and the underlying narrative would appear to be the features that most interest the artist. Bob Dylan the visual artist demonstrates phenomenal powers of observation. Effortlessly removing himself from the limelight, he depicts everyday life in its mundane and extreme incarnations – soberly and with a superior sense for the potential offered by painting as a medium. Most of the motifs were first hastily sketched in pencils on whatever piece of paper happened to be at hand, whether a paper bag, a napkin, or a sketchpad. Back in his studio Dylan would then continue work on the chosen motifs on canvases. The process adds a strong narrative element to the paintings, another feature which marks a radical departure from the frozen instants typically seen in his earlier watercolours. With this new development Dylan establishes a link to a figurative tradition that has stayed alive, particularly within US art, up through the 20th century despite the attempts made by avantgarde art at putting it to rest. This tradition has roots that go back to painters such as George Bellows and Thomas Hart Benton. A total of 40 paintings and 8 drawings from The Brazil Series are featured at the exhibition. Read it all here. More is at the Denmark National Gallery website as well. Tip of the Tinfoil to RWB! If the painting in this story is indicative of Mr. Zimmerman's other works, he could take his spot alongside of the impressionist masters.